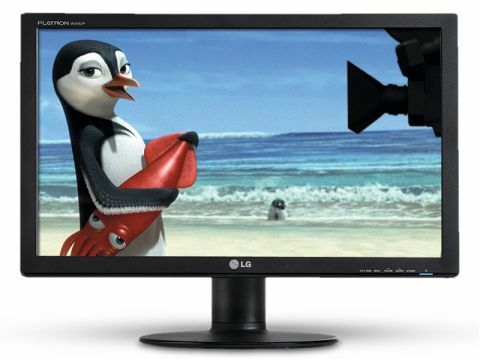 The LG Flatron W2442PA offers an amazing 24-inch widescreen display with a Full HD resolution. The monitor sits on a large and imposing stand that offers full swivel as well as vertical tilting. What's more, the screen can be used in either landscape or portrait mode, making it ideal for those who want to use it as a secondary monitor, as well as those looking to use it for movies and office tasks. The Flatron has a thin bezel around the edge that holds the Power button as well as the controls. The small buttons are unobtrusive and don't detract from the simple lines of the monitor. Curiously, there is a button for switching the screen from widescreen to 4:3 aspect ratio, which we found practical to use when web browsing, as it prevents web pages from being stretched to fill the screen. Connections on the rear of the unit allow for DVI, VGA and HDMI, so you'll be able to make the most of the Full HD resolution by connecting a Blu-ray player or laptop. LG has also included a full range of cables with this monitor, so you should be able to easily hook up your laptop, no matter which connections it has. What's more, the screen has a 300 cd/m2 brightness making it ideal for office tasks as well as for running video through. LG is claiming this device has a 10,000:1 contrast ratio, which is digitally controlled, and we found image quality to be highly impressive and certainly in keeping with what we'd expect at this price point. Movies look crisp and sharp, while office-based tasks and web browsing are a pleasure on this size of display. The LG Flatron W2442PA is an amazing widescreen display that makes the most of the latest advances in TFT technology. We found images sharp and bright and, while it's certainly expensive, this is a monitor well worth considering.